Joe Primanti started selling sandwiches to truckers in the 1930s. It was an easy meal to eat on the road and the Strip District was bustling with late night delivery trucks. Joe’s brothers joined him in the restaurant business and the demand for the sandwiches has continued to grow. You can now try a Primanti Bros “Almost Famous” sandwich at 20 locations in Pennsylvania and Florida. The signature toppings on all Primanti Bros sandwiches are tomatoes, cole slaw and french fries. 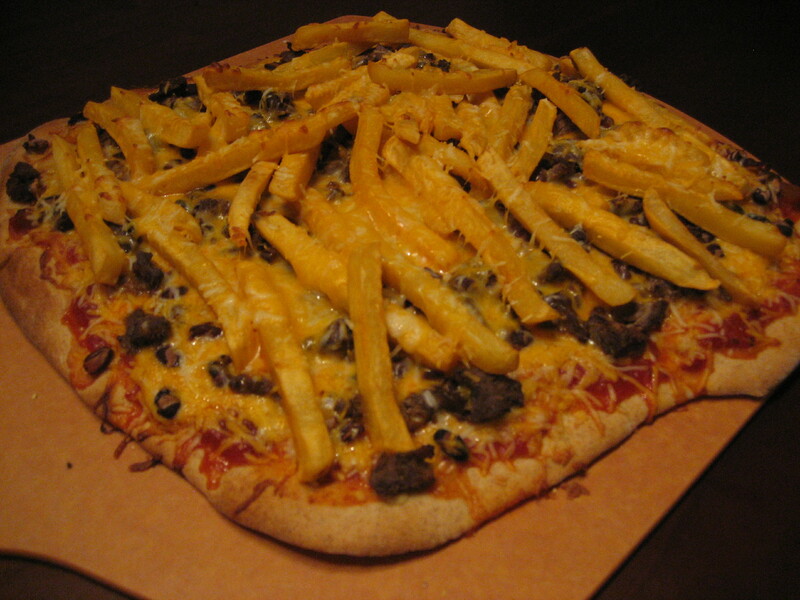 I was excited by the idea of getting to put french fries on pizza after using them in my California Burrito Pizza Recipe. And experimenting with cole slaw reminded me of using mac salad on my Garbage Plate Pizza. With over 20 speciality sandwiches on the Primanti Bros menu, I decided to turn their Pastrami & Cheese sandwich into a pizza. I pre-baked the dough, then covered it with provolone cheese, and topped that with shredded pastrami. I added sliced tomatoes, then arranged the french fries and sprinkled on some extra cheese. While the pizza baked I prepped the slaw. I made a vinegar based dressing for the cabbage, it had a nice sweet and sour taste to it. When the pizza was out of the oven I topped it with the cole slaw and sliced it up. It was sort of a challenge to get all of the toppings in one bite but I was up for that challenge. The saltiness of the pastrami, cheese and fries combined with with sweet and sour flavors of the slaw tasted so good together, my mouth is watering just thinking about it! 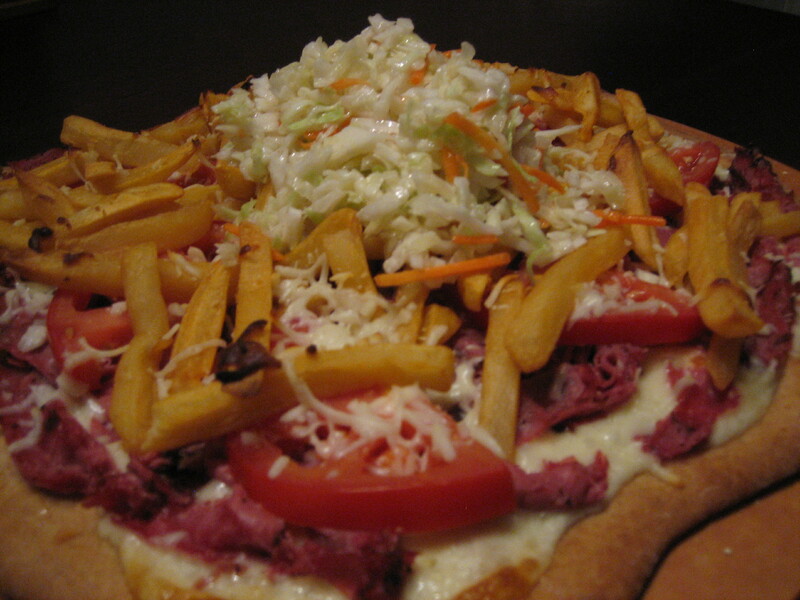 The Primanti Bros know their sandwiches and I have them to thank for inspiring my Pittsburgh Pastrami Pizza recipe. If you walk into Adalberto’s Mexican Food in Sacramento, CA and order a California Burrito you might be surprised when you take your first bite. What makes a California Burrito different from any other burrito you ask? In addition to beans, salsa and cheese, you’ll find streak and french fries. Genius! Our friend Lauren calls Sacramento home and she grew up enjoying this west coast guilty pleasure so we invited Lauren to indulge in my California Burrito Pizza recipe. I started by seasoning the strip steak with garlic salt and pepper. Then grilled it. After pre-baking the dough, I spread on a mixture of salsa and marinara, sprinkled on Mexican cheese, the beans and the steak. Prior to assembling the pizza, I baked the french fries to make sure they got crispy. After adding the other toppings I threw on the french fries and another sprinkling of cheese. I knew Andrew and I would love this pizza. It was a burrito with french fries made into a pizza; come on now. But I was looking forward Lauren’s opinion since she has had the real deal. She loved it too. She did comment that mine tasted healthier, less greasy than the typical Adalberto’s California burrito. This pizza was so good I think I may need to take a trip to Sacramento to try the original!